Wounded, sick and lost animals seem to appear all the time, from just about anywhere. Our wonderful rangers at Laguna de Apoyo Nature Reserve today brought a baby Southern Spotted Skunk (Spilogale angustifrons) to our door. Our fear of its repulsive and persistent odor was gradually defeated, as he did not smell nor did he threaten us. We took the baby skunk from its cardboard box, and gave him a once-over. Or to be more accurate, the little skunk gave Gaia Program Director Jeffrey McCrary a once-over, more than once! 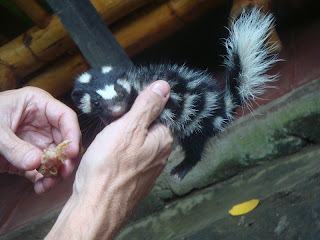 Southern Spotted Skunk. Photo by Pablo Somarriba. Wildlife such as this is abundant in Laguna de Apoyo Nature Reserve, but we don't get opportunities to see skunks up close. Jeffrey and the little skunk made peace, and actually got along quite famously. The baby skunk sleeps in Jeffrey's hands. Photo by Pablo Somarriba. The baby skunk was found with a parent in a rock wall inside the urban center of Masaya, and was captured and taken away by the rangers, who did not remove the adult. Prudent choice probably, as skunks invariably spray when upset. Even though Masay is among the largest cities in Nicaragua, it is surrounded by forests, and wildlife can easily find its way into the urban areas. He had been injured, evidently by someone trying to harm him by striking him. 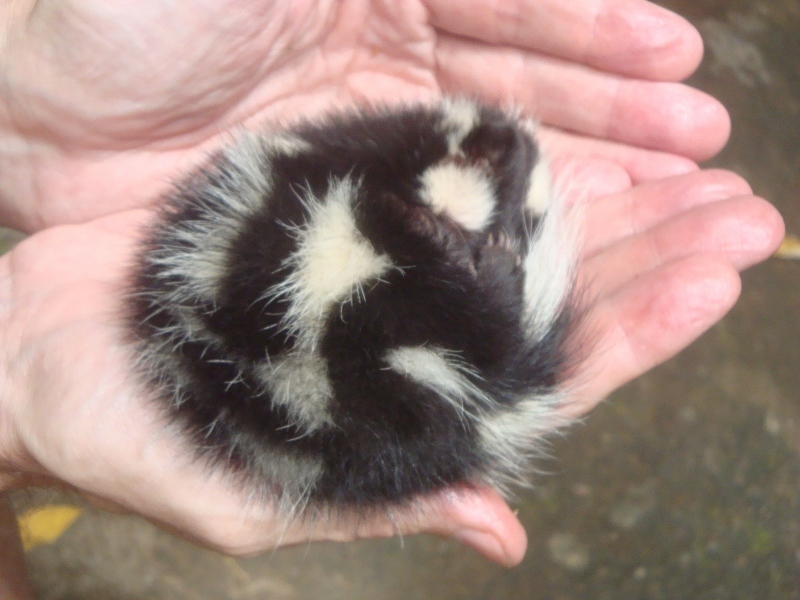 The left eye of the baby Southern Spotted Skunk has been struck and is swollen. Photo by Pablo Somarriba. 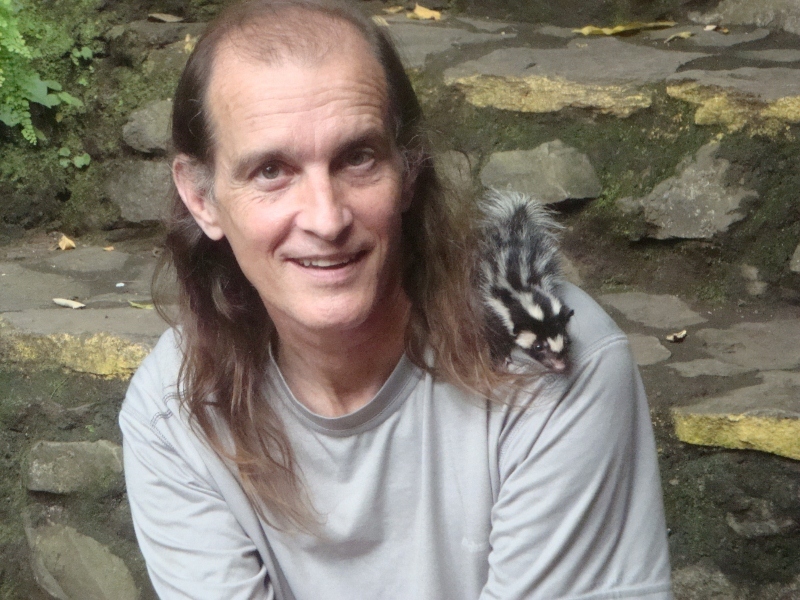 The Southern Spotted Skunk is quite common in our area. 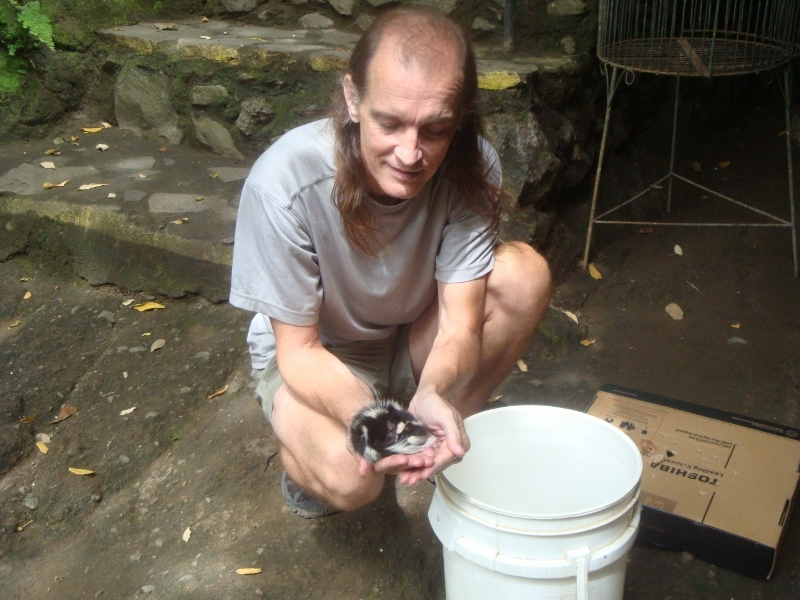 This skunk will be released near Estacion Biologica when we think he has a good chance to survive in the wild. Meantime, we will need to provide him with a lot of attention to assure access to water and food, a clean space, exercise, and hopefully, soon he will be in the wild again. Our interns gathered fruits from the forest at Laguna de Apoyo Nature Reserve while the skunk posed for a photo session. Photo by Pablo Somarriba. The skunk hasn't sprayed yet! Photo by Pablo Somarriba. 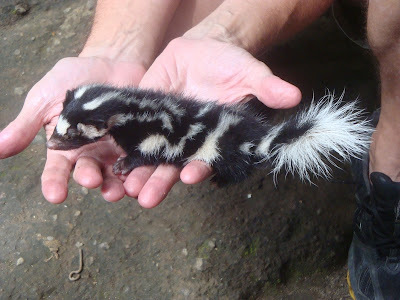 Southern Spotted Skunks are common in Laguna de Apoyo Nature Reserve. Photo by Pablo Somarriba. The baby skunk seems to be healthy, in spite of a bruised eye. Photo by Pablo Somarriba. The skunk tries a different kinds of foods. He went for water and jocotes. Photo by Pablo Somarriba. In the video below, the little skunk is making some curious noises! He sounds like a squeaky ball bearing. This baby still fits in a single hand! Photo by Pablo Somarriba. Would you like to help us with this little animal? A bag of dog food would do wonders toward making him happy. Please consider donating time or food for this animal and other wildlife that need a second chance. 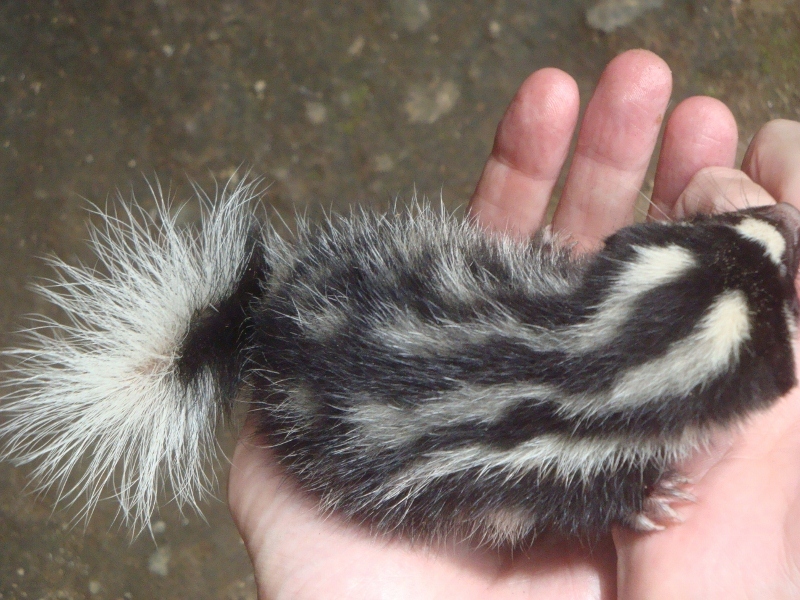 The misfortune of this baby skunk is nothing more than having entered a human-inhabited area. We want to find a way to re-insert him into nature as expediently as possible. Although Laguna de Apoyo Nature Reserve is named for its prominent lake, there are many, diverse, interesting birds in the forest which lines the crater interior. The tropical dry forest ecosystem is alternately exceeedingly dry and wet, by seasons. The forest contains lots of wildlife, although the proximity of human settlements and tourism in the area threatens their populations. In our bird monitoring project, we have learned many things about the bird community of the forest here. Some birds never seen by us or only rarely, have been captured in mist netting, for instance. 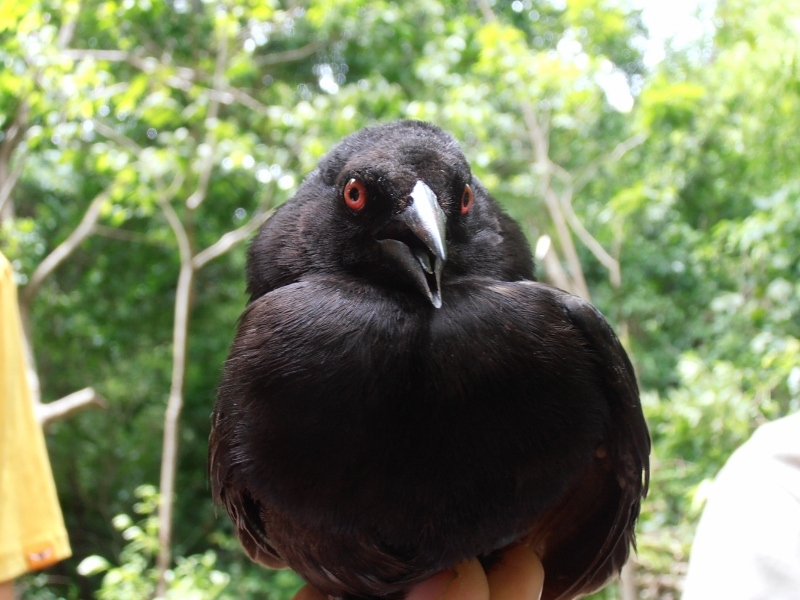 The Giant Cowbird (Molothrus oryzivorus) was captured by our bird monitoring team in Laguna de Apoyo Nature Reserve. Photo by Wendy van Kooten. Birds do some amazing things. Some of them don't make nests. The females, once fertilized, place their eggs in the nests of other birds. Cowbirds are famous for this, and some cuckoos. The Giant Cowbird, Molothrus oryzivorus , is one species which does this. In Laguna de Apoyo Nature Reserve, the Montezuma Oropendola (Psaracolius montezuma) colonies, which number dozens of nests sharing a single tree, are sought by the Giant Cowbirds for nest parasitization. The eggs of nest parasites typically hatch more rapidly than the eggs of the host species, and the chicks are more precocious, that is, they are more vigorous upon hatching and they get fed preferentially, because they have the mouth highest when the parental birds come with food to share. This female Summer Tanager (Piranga rubra) migrated from North America at the end of its mating season. Photo by Wendy van Kooten. Many birds migrate enormous distances each year, among them, the Summer Tanager (Piranga rubra), which is common in Laguna de Apoyo Nature Reserve during the months September through May. The males are more active than the females and much more visible, flaming red colored. During the month of September, we often see immature Summer Tanagers begging food from mature adults, even after making a migration of more than one thousand kilometers, showing a very special prolonged dependence on the part of the first-year birds. The Elegant Trogon (Trogon elegans) is gorgeous, but it makes a downright nasty sounding call! Photo by Wendy van Kooten. More than half of the species of birds found in Nicaragua do not undergo extensive, seasonal migrations. Some of those birds have very special diets and other needs for their life and reproduction. Among them are are the trogons. In Laguna de Apoyo Nature Reserve, three trogon species are common-one of them is the spectacularly colored Elegant Trogon (Trogon elegans). These birds consume fruit and nest in holes in relatively soft trees where their weak bills can carve or widen previously made holes. The trogons often occupy holes made previously by woodpeckers. The Elegant Trogon is large and gaudy, but not found just anywhere. 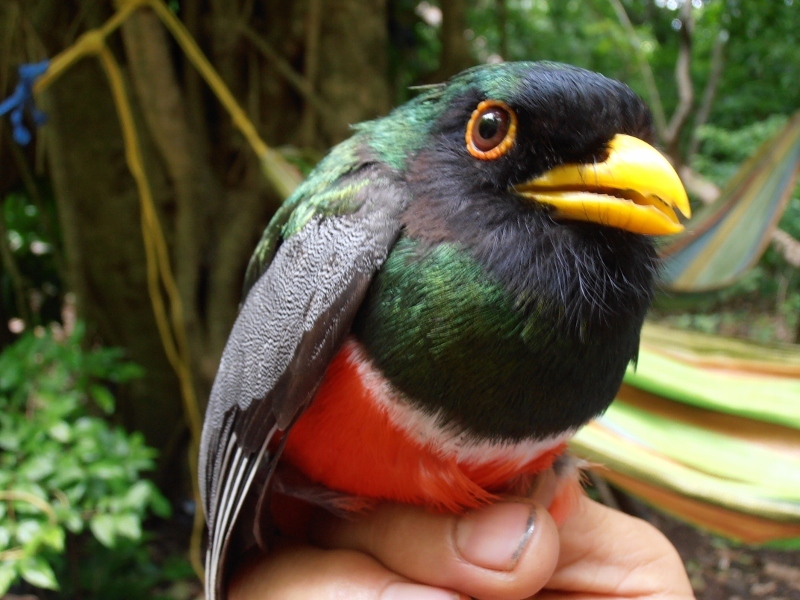 Fortunately for us, we sometimes capture Elegant Trogons in the mist nets. We take several measurements of the birds captured during mist netting. 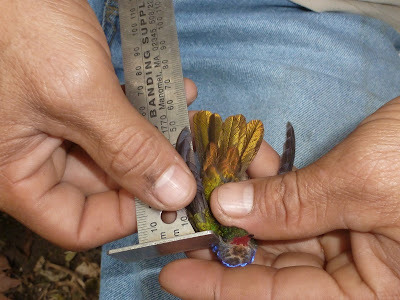 Elmer measures the wing of this Blue-throated Goldentail (Hylocharis eliciae). Photo by Wendy van Kooten. The hummingbirds (Family Trochilidae) are the smallest of birds in the Nicaraguan forests, and Laguna de Apoyo Nature Reserve boasts several species. 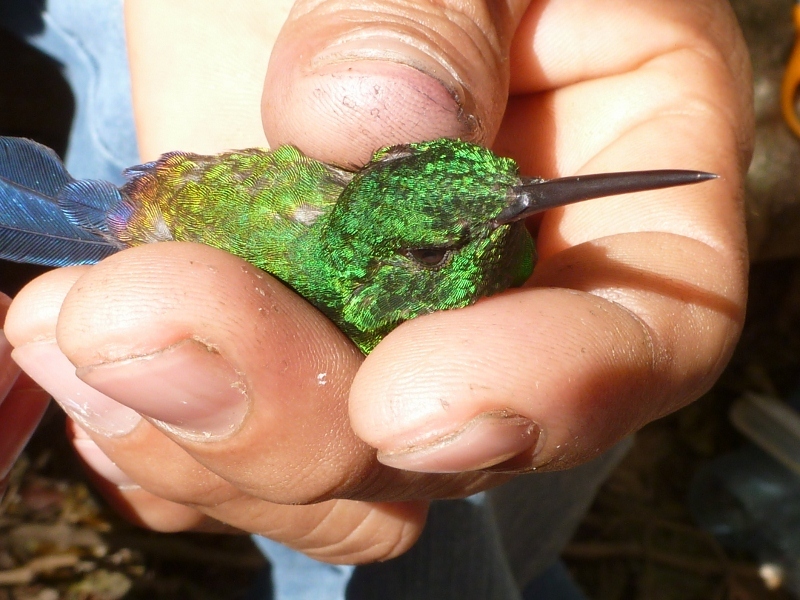 We often capture hummingbirds, and having one in the hand is an unforgettable experience. Hummingbirds are even more beautiful at close range than when sighted several meters away. One species, the Ruby-throated Hummingbird (Archilochus colubris), alternates between North America and our region, the others are year-round residents in Nicaragua. Our team eats well during their work! 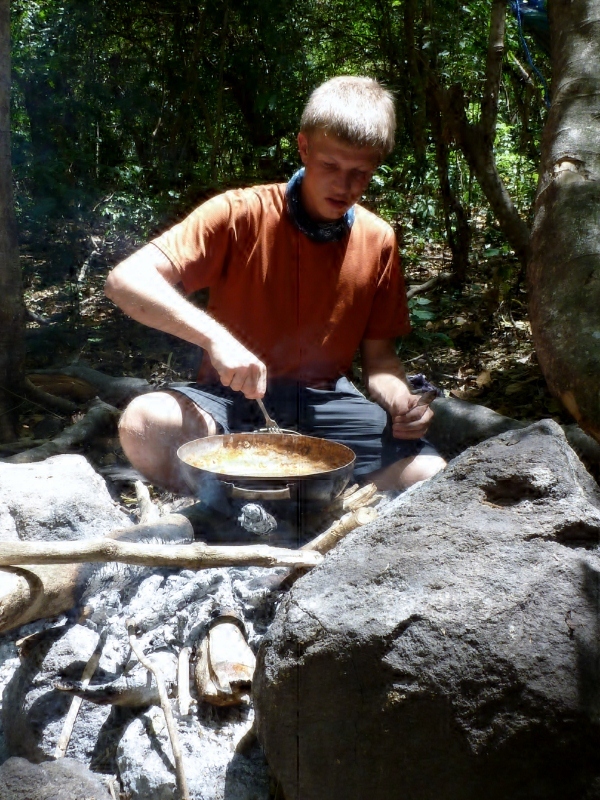 Florian prepares the stew. Photo by Wendy van Kooten. 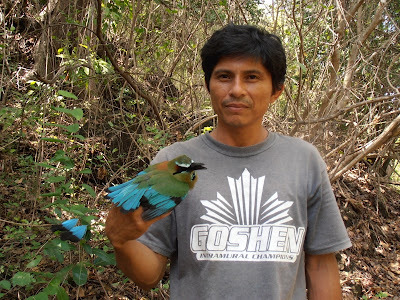 Monitoring the bird populations mostly means creating an extensive database in which we learn more and more about the birds present in our forest. We capture birds every month of the year. Some bird species are captured often, others very rarely, and all this information helps us understand which birds are there and what they need to live in these forests which are affected more and more by human activity. We complement mist-netting with observations by sight and hearing, made quantitatively. As one might expect, many conspicuous birds are not caught, and many birds caught are hardly noticed by our observers. 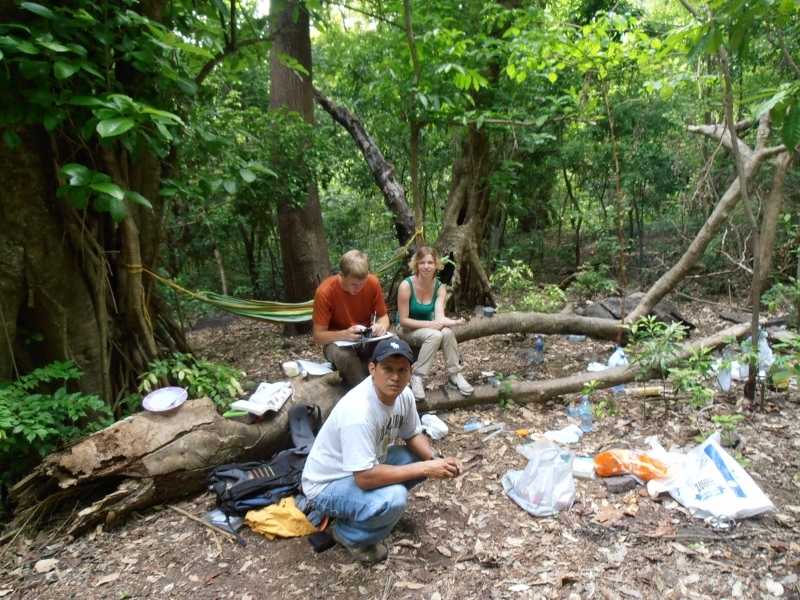 Our team transcribes data and rests between periods of bird measurement. Photo by Wendy van Kooten. Volunteers manage this project, some of them coming from developed countries. We invite anyone interested in learning about birds to apply for this project. 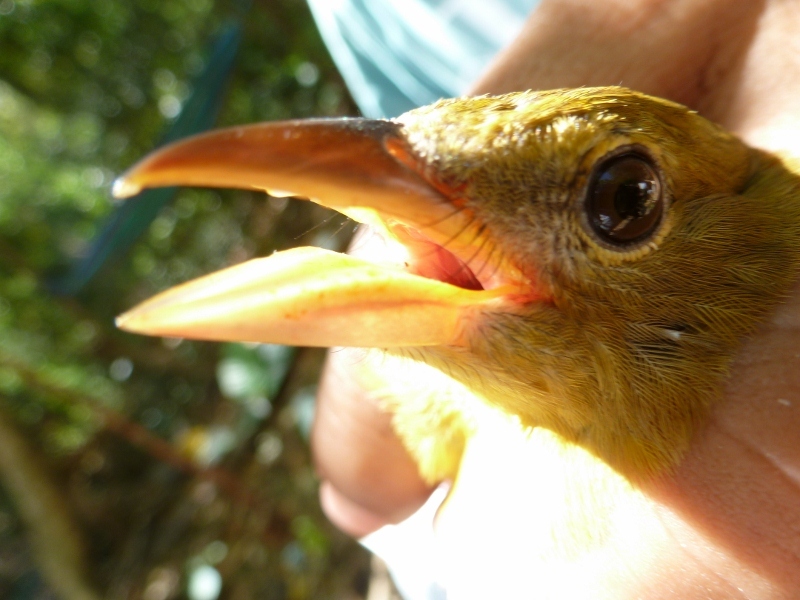 A volunteer or intern can learn about the tropical birds and how to handle them. The opportunity to work in the outdoors, under the canopy of the jungle, with monkeys and other animals always nearby, is unforgettable. To volunteer to work on this project, please write us here. The most common bird captured in mist netting in Laguna de Apoyo Nature Reserve is the Long-tailed Manakin (Chiroxiphia linearis). Photo by Wendy van Kooten. Among the very special birds in Laguna de Apoyo Nature Reserve is the Long-tailed Manakin (Chiroxiphia linearis). 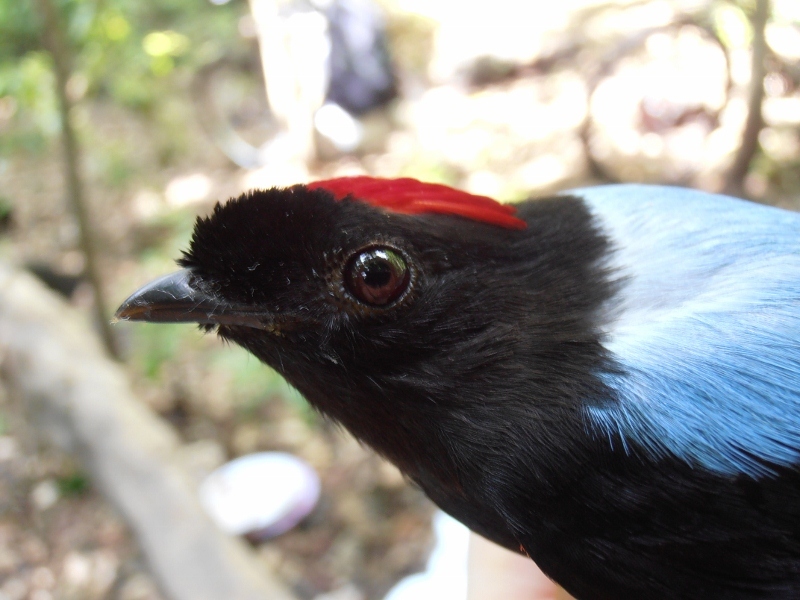 The males are boldly colored, in crimson red, baby blue and jet black. We capture more of this species than of any other in our monitoring project. We also find it interesting that we catch many more males than females. Males engage in very interesting courtship dances, usually performed by two males in tandem. The Myiarchus flycatchers are very similar, and difficult to distinguish. Photo by Wendy van Kooten. 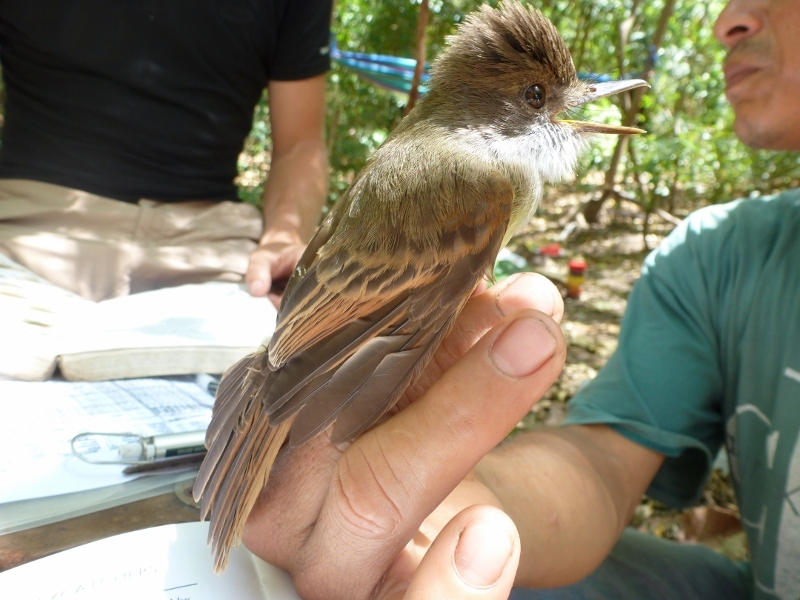 Mesoamerica hosts many species of tyrant flycatchers (Family Tyrannidae). In Nicaragua, several very similar flycatcher species are found of the genus Myiarchus. Our technicians have their work cut out for them when a Myiarchus flycatcher is captured. Some of them are more easily distinguished by voice than by sight. The Blue-tailed Hummingbird (Amazilia cyanura), pictured here, looks very similar to the Steely-vented Hummingbird (Amazilia saucerrottei). Photo by Wendy van Kooten. Several identification issues exist among birds, and in Nicaragua, one of them is found among two hummingbird species: the Blue-tailed Hummingbird (Amazilia cyanura), and the Steely-vented Hummingbird (Amazilia saucerrottei). These two species have different, but overlapping, ranges, and both are found in Laguna de Apoyo Nature Reserve. 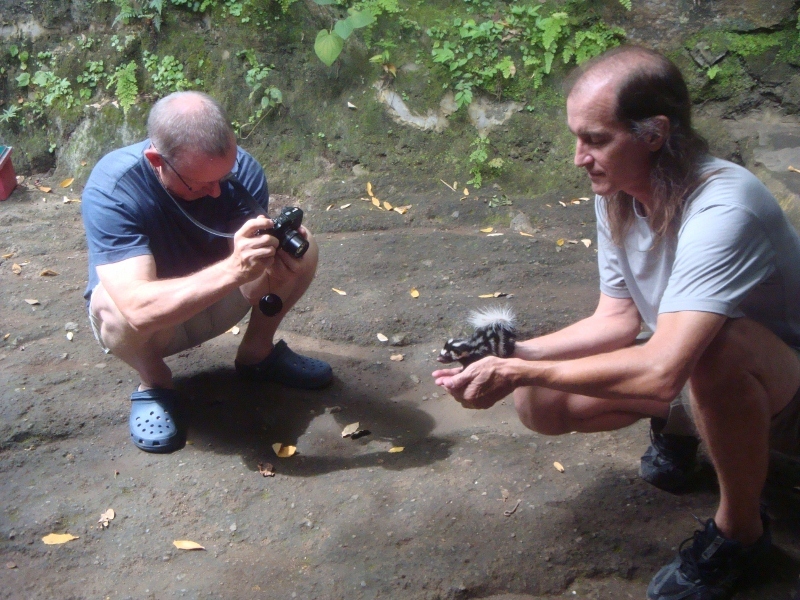 Our monitoring allows us to gather information about these two species and begin to understand how they interact. It also gives us some incredible opportunities to enrich our birdwatching experiences: now we know how the bird looks in the hand, it makes the bird seem more colorful and alive when perched several meters away. The Turquoise-browed Motmot (Eumomota superciliosa) is loved by all Nicaraguans. Photo by Wendy van Kooten. For us, the study of birds is also a study of humans, because the birds we study react in unique ways to the presence of humans. Also, we humans react differently to different species of birds. For instance, the Turquoise-browed Motmot (Eumomota superciliosa) always evokes a thrill from all who get to see it, and moreso when seeing it up close when captured during mist netting. Motmots are truly tropical birds, too, with vibrant colors in fascinating patterns. This species is common in Laguna de Apoyo Nature Reserve, especially because it nests in dirt banks which are abundant. Another species, the Blue-crowned Motmot (Momotus momota), is much less common here. 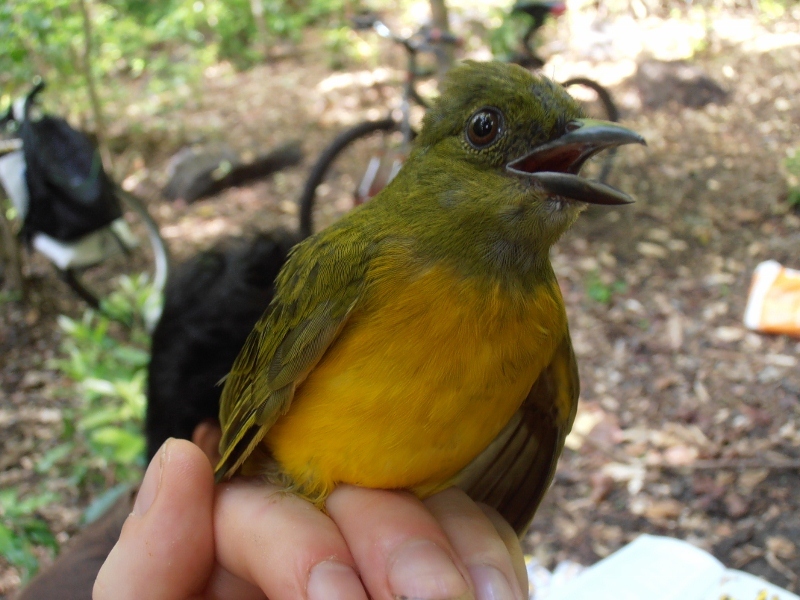 The Ochre-bellied Flycatcher (Mionectes oleaginus) captured here was a big surprise for our team. This bird is found typically in humid forests, but this documentation shows its presence considerably further westward than we expected. Most of the tyrant flycatchers feed principally on flying insects. An exception is the Ochre-bellied Flycatcher (Mionectes oleaginus) which consumes lots of fruit and seeds. Even its bill is suggestive of, perhaps, a tanager, and not a flycatcher. This species tends to blend in with the colors of the forest interior, where shadows abound, although this bird is common in at least some habitats. 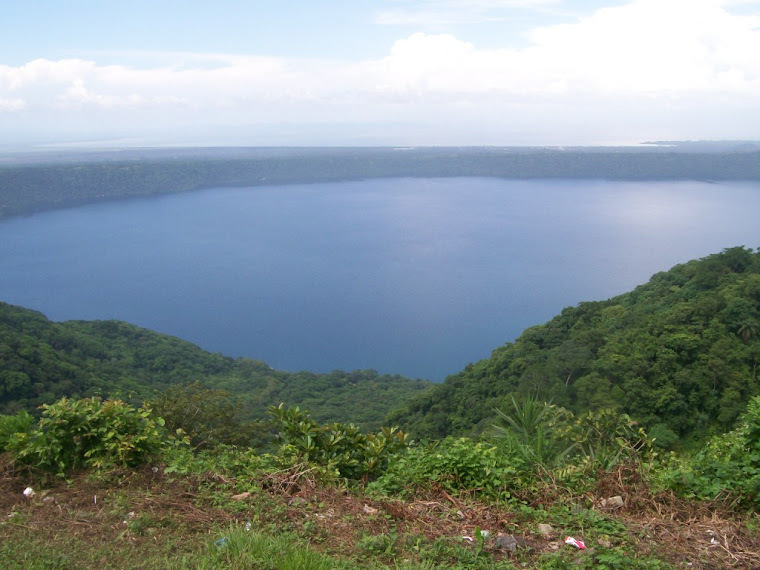 Most tropical lakes have dark water, but a few, like Laguna de Apoyo, make for excellent SCUBA diving. This lake is sitting in a volcanic crater, formed 23,000 years ago. Our research group is busy here, studying the fishes of this lake, because something interesting happened during those years since the volcano left a huge hole in the ground, it filled with water, and the fish entered. Some of them transformed into new species, and they provide scientists with a great field location to consider how evolution occurs. We are responding to the call to study these fascinating fish, all evolved from Amphilophus citrinellus, the Midas cichlid. Juvenile fishes leave their refuge to investigate divers in their area. Photo by Garey Knop. Our group has discovered five new species in this group of fishes in Lake Apoyo. Adding to the list the arrow cichlid, Amphilophus zaliosus, discovered by Barlow and Munsey in 1976, and we have to date, a group of six closely related fishes with similar appearances, plus an unknown number of other fish that may also be recognized someday as unique species. 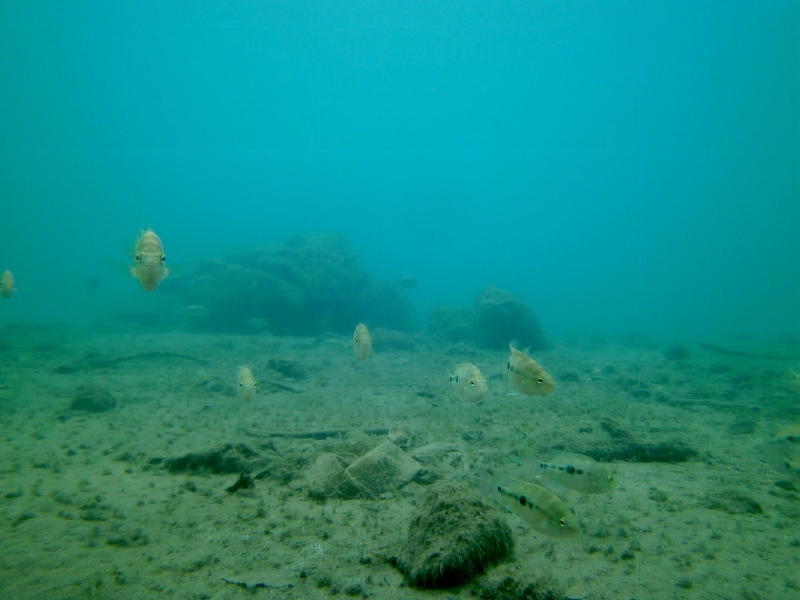 Several of those fish are seen in the video below, taken by Garey Knop in one of our monitoring dives. The fish of this special group are important for more reasons than just for having evolved recently into a rainbow of new species. The members of this species group provide very interesting parental care to their offspring, until the babies are several weeks old. We are very interested in how these special fish choose their mates, find their breeding grounds, and defend their fry. Here is another video by Garey Knop, in which a pair of arrow cichlids (Amphilophus zaliosus) are defending their fry, only three days since becoming free-swimming. The fry are difficult to see, but there are about 1200 of them, usually beneath the female (the smaller of the parents). This breeding pair has made a nesting site in a featureless area, with filamentous algae covering the muddy/sandy substrate. 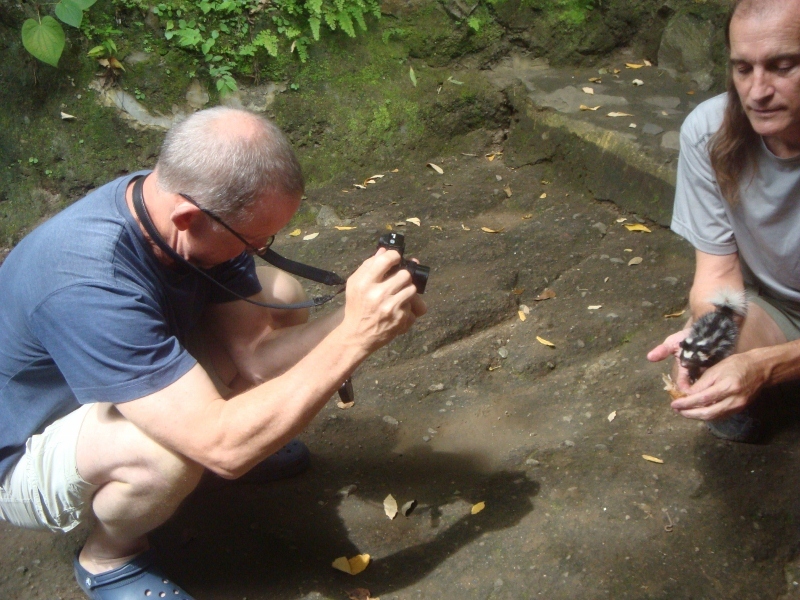 The pair dug a hole about 80 cm wide to uncover a basalt rock surface where the eggs were deposited and fertilized. The nearest nest to this one was about ten meters away. Relatively few fish passed through the area, excepting the harmless Atherinella sardina (silversides). Both parents were busy, vigorously defending the fry. During our half hour watching the pair, the fry boldly approached us, and some of them fed on the skin on the photographer's hand! 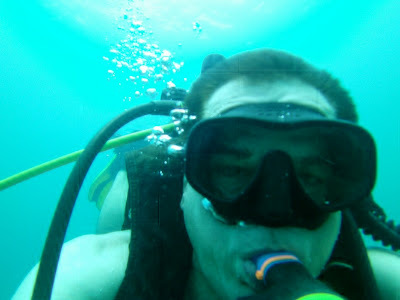 Garey feels at home underwater. Lake Apoyo does not have dangerous fish or currents. Photo by Garey Knop. 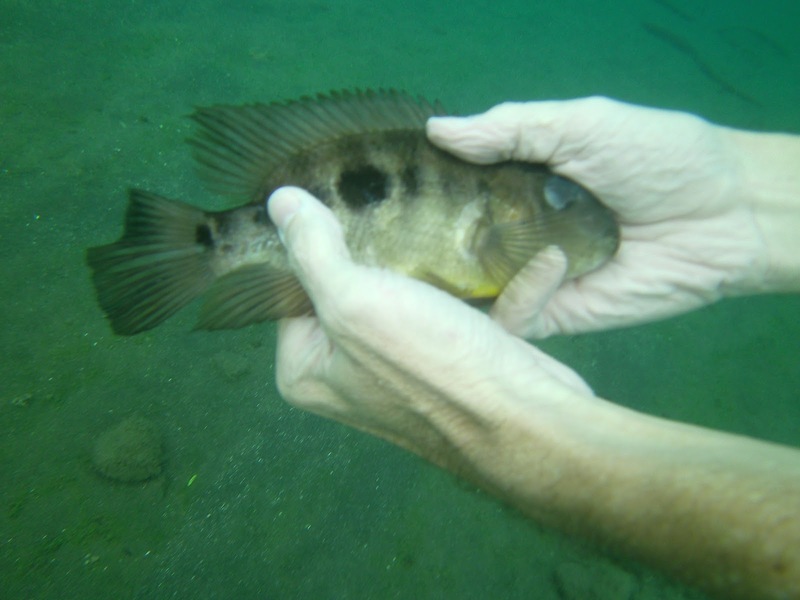 Lots of blind fish are found in Lake Apoyo. A parasite is suspected, although the eyes are removed by other fishes once the fish go blind. The epidermis of this fish has covered the orbit after the eye was extracted. This fish has several slash marks caused by other fishes in their attempts to bite the eyes. Photo by Garey Knop. This blind fish shows the eye clouded by cataract. The opposite eye had already been eaten by other fish. Note the caudal fin missing a large piece, presumably eaten by some predator. Photo by Garey Knop. Crabs (Potamocarcinus nicaraguensis) are common in Lake Apoyo. Photo by Garey Knop. 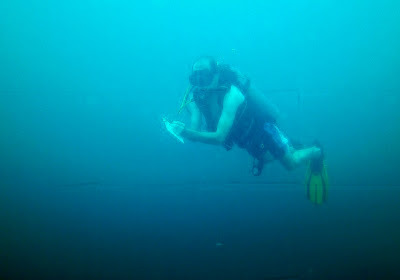 In a typical monitoring dive, we see about a thousand fish. 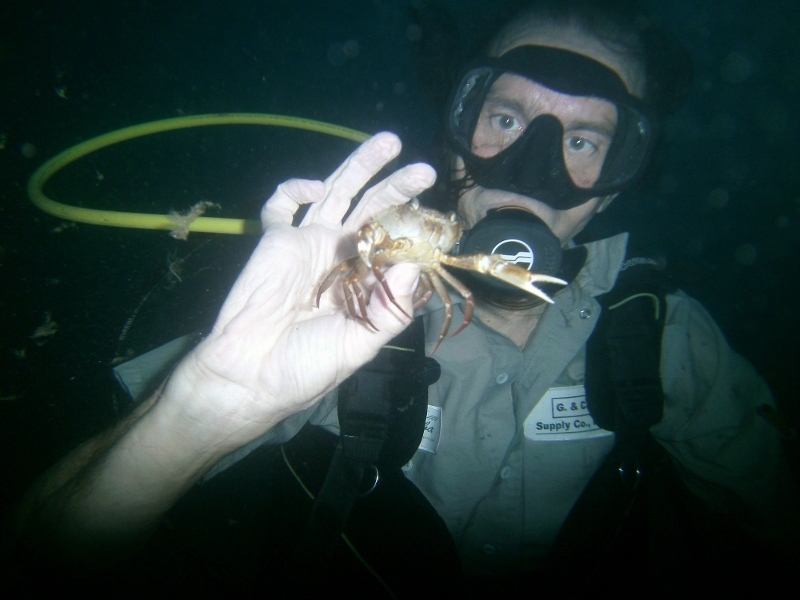 Almost every dive we see a crab. 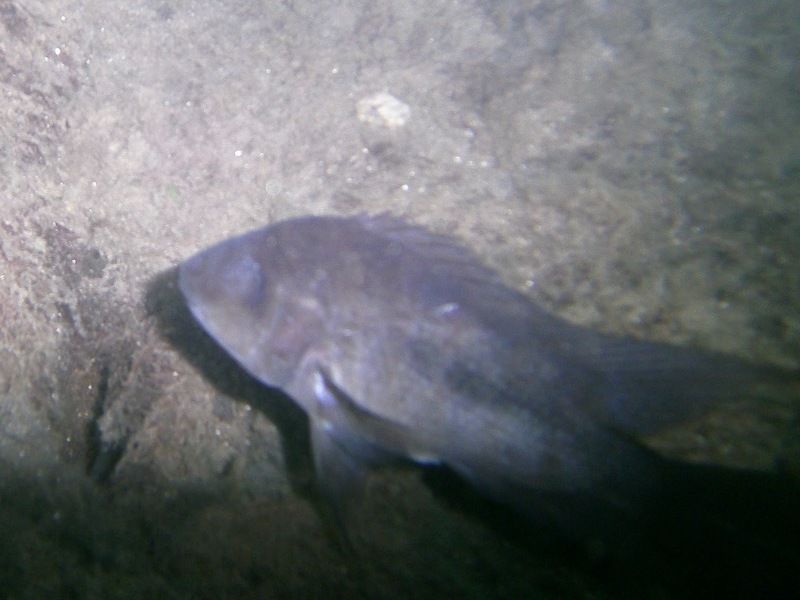 From November through January, lots of fish are reproducing, and we can watch them provide parental care up close. Lake Apoyo has the clearest and cleanest water of any lake in Central America. We gather data from the best perspective, watching the fish from a few meters distance. Photo by Garey Knop. Would you like to help us study these fishes? If you are a certified open water diver, you can accompany our staff on a monitoring dive, and help us learn more about these fascinating fish to protect them better. Please let us know-we will take you on a dive. A view of almost any part of our planet by airplane demonstrates the dramatic effects humans have on it. The number and sizes of places where wild animals rule and humans do not make dramatic alterations are far exceeded by those where trees are removed, buildings are built, concrete is poured, and roads are built. There are more people on our planet every day, and fewer places for wild animals to live. Wilderness areas are under attack, especially in places like Nicaragua. Land is cheap, and laws to prevent forest destruction often don't get enforced. When land is scenic, such as at Laguna de Apoyo Nature Reserve, wilderness might not stay wild long, regardless of laws and regulations. Cutting trees, hunting wildlife, clearing land, and building houses are all illegal here, but many of these activities occur anyway, because vigilance and enforcement is insufficient. The dream of many US citizens is to own a little corner of paradise, and places like Laguna de Apoyo appeal to lots of them. Although many honest real estate agents can be found in Nicaragua, Laguna de Apoyo is overwhelmed by unscrupulous agents, investors and speculators, often advertising "ready to build" for lots where construction is not permitted. These people entice foreigners to drop their money on property with a great view, a gorgeous, warm lake before it, basically by fooling them. At Estacion Biologica Laguna de Apoyo, we often receive visitors who have bought land in Laguna de Apoyo Nature Reserve under deception, and these people are always regretful of their purchases. It is a shame to watch people discard their lifetime savings on something too good to be true, which, alas, is not true. What is sadder than watching drama unfold in the lives of many, unwitting US citizens who experience buyer regret, however, is the terrible implications on the Laguna de Apoyo Nature Reserve. Almost daily, we witness the unnecessary and illegal destruction of natural areas around us. Rather than just sit and watch helplessly as this wild area vanishes, we work closely with the Nicaraguan Police, the Ministry of Natural Resources and the Environment (MARENA), the local municipality of Catarina, environmentalist organizations and the local community to keep Laguna de Apoyo wild. Among the actions we take to save our beautiful surroundings is to plant trees and shepherd them on their way to regeneration of good forest. Lots of trees were donated to the Laguna de Apoyo Reforestation Project by CARUNA, and Movimiento Ambientalista Guardabarranco provided strategic support and lots of energy in planting them. Photo by Jeffrey Munguia. September 7, 2012 became a big day for us in our attempt to plant the most trees possible. 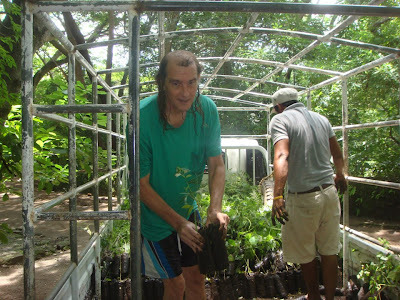 We had thousands of small trees in our nursery at Estacion Biologica Laguna de Apoyo, and two more good months of rain on their way made the date ideal for planting these trees in the forest. 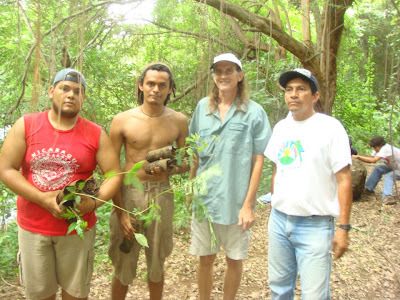 Nicaraguan volunteers carrying saplings of native trees converge on the reforestation site in Laguna de Apoyo Nature Reserve. Photo by Jeffrey Munguia. 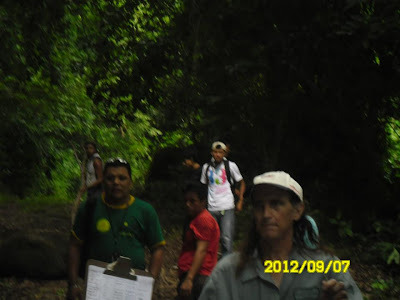 MARENA and Movimiento Ambientalista Guardabarranco organized local participation from Masaya, along with our friends and neighbors inside our area. 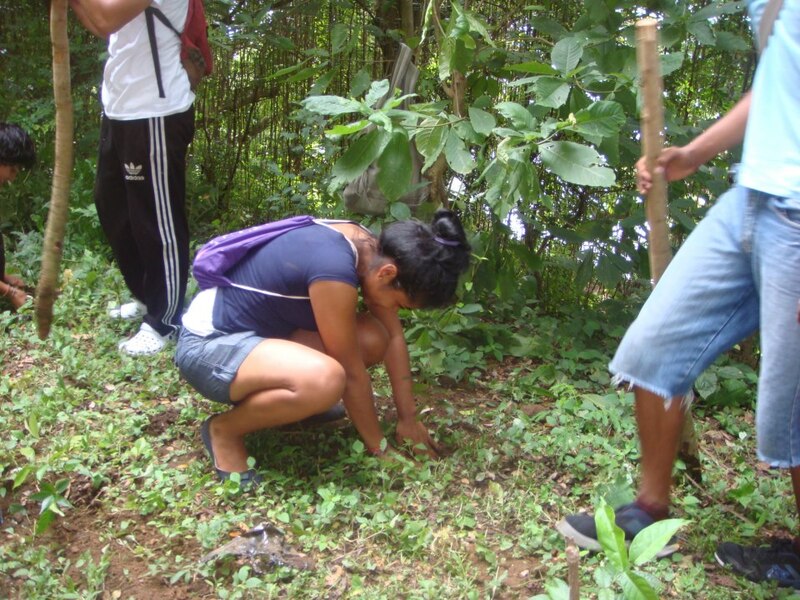 We moved more than 2500 trees to the planting sites, and people were digging holes with shovels, machetes, and even sticks. More people than implements were available, but there was plenty to do. Trees, trees, and more trees. Photo by Jeffrey Munguia. Volunteers responded to the call, from Masaya, Granada, San Juan de Oriente, Catarina, and Masatepe, and lots of foreigners visiting in the area came, too. 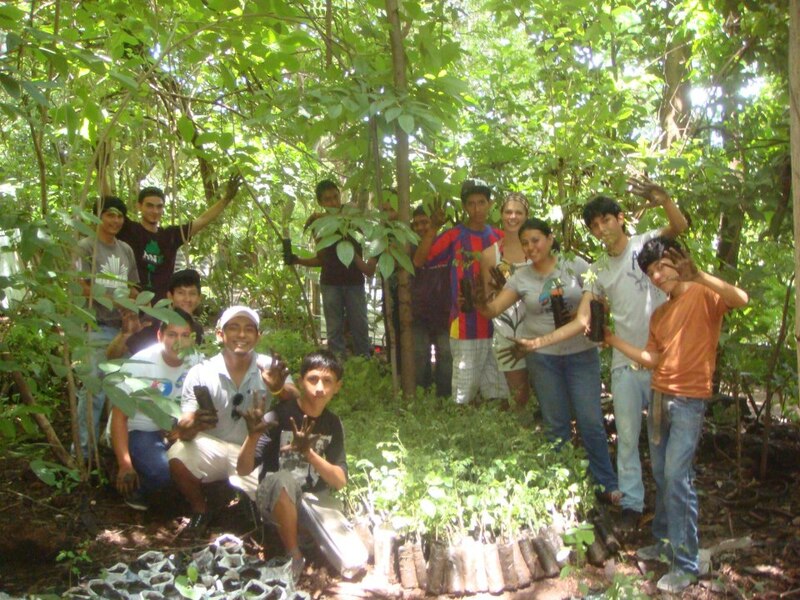 We were amazed by the massive participation in our reforestation activity, which reflected local interest in protecting and caring for Laguna de Apoyo Nature Reserve. Many Nicaraguans want to participate actively in caring for the environment, and this location is deep in the hearts of many of them. Enthusiastic participation of Nicaraguan volunteers made our tree-planting day a tremendous success. Photo by Jeffrey Munguia. A road which was once used to enter La Abuela Lodge was blocked, and we planted hundreds of trees along its length. The land, owned by the municipality, was deemed to be no longer a route for vehicular traffic, so we helped to reconvert it to part of the forest! Local schools, neighborhood organizations, and many agencies from Masaya helped with our tree-planting activity. CARUNA and the Ministry of Family Economics also aided by bringing refreshments which were welcome after a few hours of hard work by all. Photo by Jeffrey Munguia. Our neighbors came and helped, including the children and teachers of the local high school. Our local teachers want their students to learn by doing and to contribute to their community. 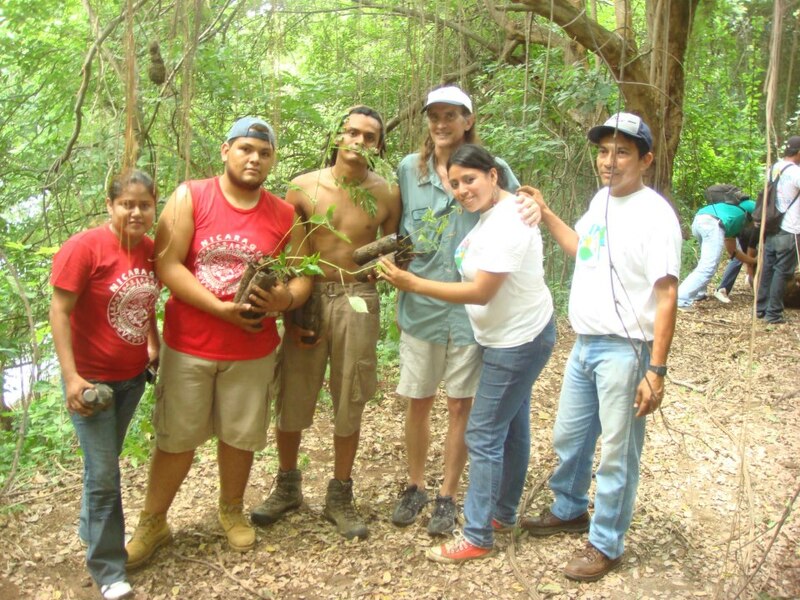 We enjoy working to save nature in Laguna de Apoyo even more when we see how much Nicaraguans also enjoy this work. Stakes made from branches made excellent implements for digging small holes to place saplings. Thanks to Elmer Nicaragua for devoting extra time from his day for making these stakes. Photo by Jeffrey Munguia. We always feel rewarded when Nicaraguans are grateful for what we do and want to share their effort with us. 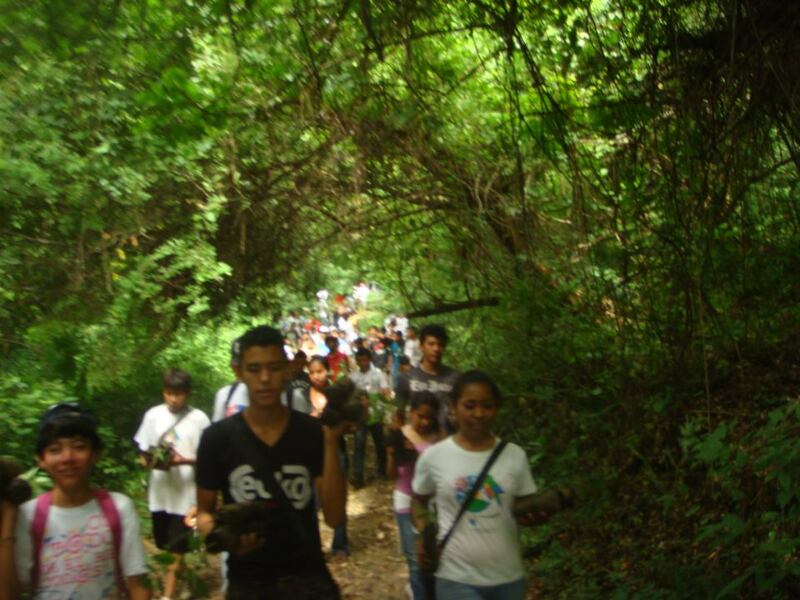 This day showed clearly that Nicaraguans care about keeping Laguna de Apoyo Nature Reserve wild, by the hundreds of people who came with energy and a smile to the reforestation activity. Everyone can help to plant a tree, young and old, and many helped without expecting any kind of recompense beyond the knowledge that they have worked to protect wild nature in their country. While some hammed it up for a photo opportunity, others moved large rocks to block the former road to vehicular traffic. Photo by Jeffrey Munguia.